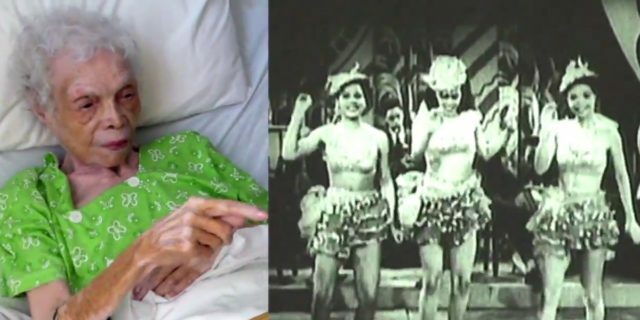 Alice Barker lived to 103 years old, and used to strut on the stage all through her 30’s and 40’s as a dancer. She was vibrant, beautiful and talented. Yet, she has not seen herself perform. With the aid of Mark Cantor of Jazz on Film, and David Shuff, they made it possible for her to see what she had never before. When they were shuffling through several old films, they discovered the ones that featured Alice, took them to the nursing home where she resides, and showed them to her. Alice loved her career as an entertainer, and it was such a delight for her to relive those moments. 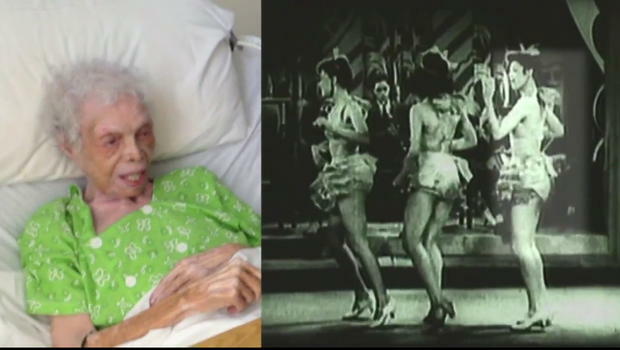 “She danced at clubs such as The Apollo, Cotton Club and Zanzibar Club, with legends including Frank Sinatra, Gene Kelly and Bill “Bojangles” Robinson,” the video’s description adds. For her whole career, she was a chorus line dancer in New York City, throughout the duration of the Harlem Renaissance 1930s and 40s, as well as Broadway. She danced at clubs like the Zanzibar Club, The Apollo, Cotton Club, and she was a part of the legendary team recognized as the Zanzibeauts. She also danced in several movies, TV shows and commercials with legends including Frank Sinatra, Gene Kelly, and Bill “Bojangles” Robinson. The brief musical films they discovered were called Soundies, and they were amongst the initial films that utilized sound. In fact, a soundie would be shot in a famous night club, and attributed a hot song or performer at that time. The films were distributed in jukebox like devices that were located in bars, racetracks, and clubs. Individuals were able to watch them for a coin. It does make sense that Alice would not have the chance to see any of the soundies when she was performing back in the day. She would see herself on TV on some occasions when she was featured in a show, or a commercial. This was before there were ways to keep a recording of one of her broadcasts herself. Alice was married twice, and did she not have any children. She has remained close with many of her dancing friends throughout her life, and well into her senior years. Yet with her illness, and prolonged hospitalization, together with her transportation to a nursing home, this caused her to lose touch with them. This was a time and an age in life when it was easier for people to lose track of one another. Furthermore, all of her memorabilia and pictures from her career had been lost during her several moves. Alice has not seen any pictures, nor has she been able to share anything more than her memories, for over a decade. Hopefully, with more information on her life story, the extent of the impact of people watching her films can be appreciated more. She received care and appreciation since that day, from those surrounding her, from people about the country, and the world. It truly revitalized her, and had her glowing so bright. She turned into a new woman. To make things even happier, Alice was able to get back in contact with several of her old dancing friends and their children, and people she grew up around. She had a conversation on the phone with a fellow worker she had not spoken to in two decades, there was lots of laughter, and tears shed. he spent the last day of her life in good spirits, listening to music, and having her fan mail read to her by Gail and enjoying every minute of it. She often spoke of how thankful and amazed she was that people took the time to write to her, and remembered her. She said, “I really feel that these people care about me.” Her fans all over the world truly gave happiness, and meaning to the last days of her life. She was always honored and humbled that she was an inspiration to others. When Gail had left for the day, Alice sent her off with a wink.